The advent of the technology age that we are currently in has brought many great things to the world. We can now communicate, travel, and learn about our world more quickly than ever. Children learn how to use the newest gadgets and are tech whizzes at early adolescence. The unfortunate downsides of this technological affinity are that we are quickly becoming a population that is overly focused on immediate gratification and fun that is had on a screen. Even classrooms are infused with these technological advancements, be it through tablets, touch-screen boards, or traditional computers themselves. Now is precisely the time that we as parents and educators should be encouraging children to use their hands to learn. Dinosaur dig kits serve that purpose, and enable children to expand their mind and practice dexterity and patience. Hands-on learning is an important element in the development of young children. Regrettably, many schools have removed programs such as art, music, sewing, woodshop, and auto mechanics. This is to the detriment of the students, ultimately, as those who are artistically and creatively inclined are denied an outlet for their proficiency. In fact, the motor skills that are learned at a young age may even go unnoticed if a child isn’t exposed to any type of project that would allow them to showcase their nimble fingers. But the beauty of a dinosaur dig kit is that kids are learning and having fun at the same time. The T-rex kit that is pictured is perfect as a stand-alone gift or even as a special game at a kid’s birthday party. They won’t know what they are digging until the entire skull becomes actualized, and their patience and perseverance will surely be tested along the way. The screens and technology we are exposed to today are often merely tools to keep us entertained. There is rarely a participation element on our part, and if it does exist, it is minimal at best. The dino dig kits that we offer here at Dinosaur Corporation buck that trend in glorious fashion, and present a new kind of learning unlike any other. 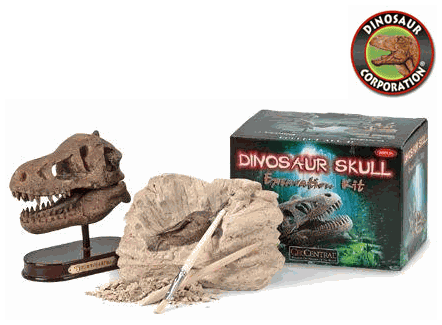 Stop by our website and discover a radical way of learning that harkens back to education methods that existed long before the technological age, as well as plenty of other dinosaur goodies.